In “The World in Crisis” I argue that the global economy has never recovered from the Great Financial Crisis (GFC) and that the measures taken by policy makers in the ten years following the GFC have in fact made things worse, creating a “lost decade”. 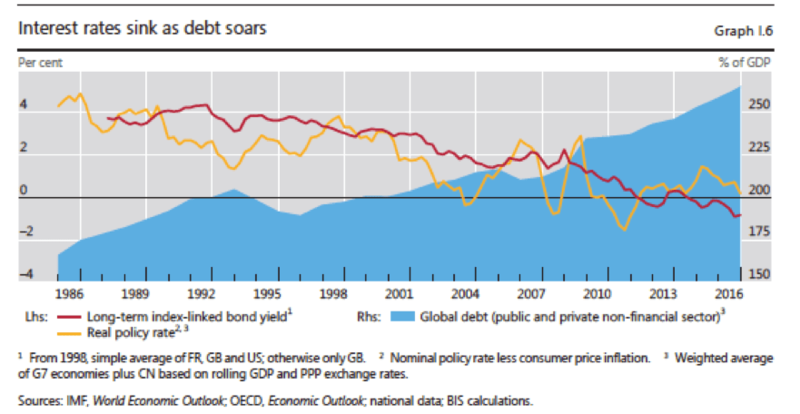 The global debt burden is unsupportable and has only been maintained for so long by interest rate which are effectively zero. These unprecedented ultra-low interest rates. Effectively zero (or below), have had a corrosive effect on lenders and those dependent on savings and have seen a transfer of wealth. As Mervyn King says, a rebalancing is required, in order to write off the enormous stock of bad debts. To underline the problem the Institute of International Finance in Washington released figures in June 2017 showing that global debt has reached $217 trillion (£168 trillion). This is 327% of world GDP, up from 276% in 2007, as the graph (below) from the BIS shows. An increasing amount of debt is being accumulated in emerging markets like China. Claudio Borio from the Bank for International Settlements (BIS) – told The Daily Telegraph that, “Financial booms can’t go on indefinitely. They can fall under their own weight”, he added that nobody knows how long this can go on or what it will look like when the denouement arrives, but arrive it will. I think that the chances are that this cycle of growing and unsustainable debt will end within two years and the events that initiate the end of the cycle are likely to come either from the Eurozone, with the failure of a major bank, or a threat to the Euro, and equally problems in China may well create the spark that ignites a global recession, different in tone from the GFC, and which will involve the destruction of huge quantities of debt, and the end of the zero-interest rate model. 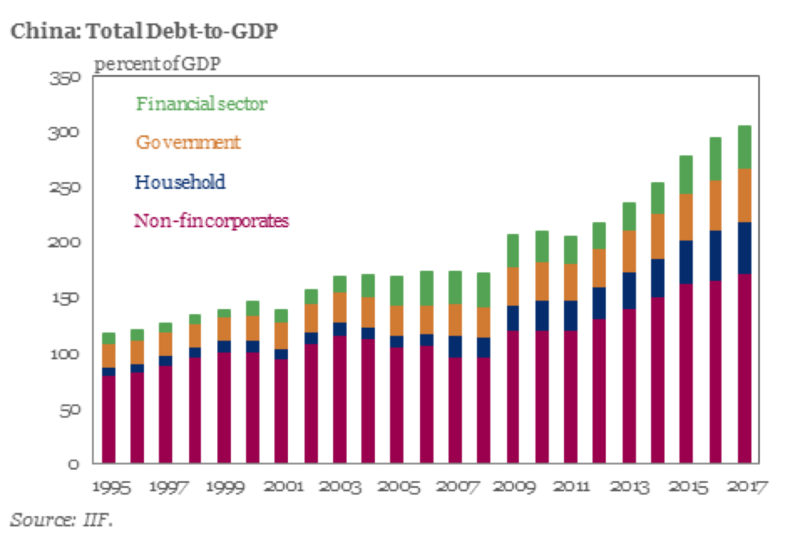 The IIF’s graph, released in June 2017, illustrates the growing problems in China, with a rapid increase in debt driven by non-financial corporates, borrowing (often in US Dollars) in order to survive. It was therefore a more than surprise when the US Federal Reserve Chair Janet Yellen spoke on Tuesday 27th June 2017 at the British Academy about how reforms made after the 2008 financial crisis have made the US banking system “much stronger” and that said “Would I say there will never, ever be another financial crisis? You know probably that would be going too far but I do think we’re much safer and I hope that it will not be in our lifetimes and I don’t believe it will be.” Ms Yellen was speaking at a question-and-answer event in London alongside British Academy President Lord Nicholas Stern. She noted that the Fed had learnt invaluable lessons from the last financial crisis and that better oversight and higher capital levels had brought about stability to the banking system. Mrs Yellen appeared to be focused entirely on the US financial system, to the exclusion of the growing risks in the wider global economy. In fact, the Fed’s policy of slowly increasing interest rates, although remaining at historically low levels may well prove to be the factor that drives emerging market debts beyond the point where they can no longer be sustained. She also reiterated her view that the U.S. central bank would continue to raise interest rates only gradually. But the global economy is extremely sensitive to increasing US Dollar interest rates rises and to any tightening of US financial policies. It is like an unexploded bomb, with a hair trigger mechanism that could go off at any moment. I am afraid that Janet Yellen is living in cloud-cuckoo land, that there will be a major crisis in her life time. The only questions are when (could be any time soon) and where (I think China is a possible candidate, with the Eurozone as a second choice). (c) Andrew Palmer, 2017, not to be republished without permission.